Oh my, what a busy week. I am so happy that the weekend is here. So I was thing this week was crazy busy, but as I look ahead I think that I will need a lot of deep breathes and maybe some wine. One month from today, report cards will be due ( I should start assessing) and I will be moving into my temporary classroom for the rest of the year. Packing is tough. Trying to sort through what I can live without until next school year, what I may want to keep out for planning purposes, and what I will need for the last few months of the year is hard to do. But when I look at the big picture, and see that I will be in a brand new classroom next school year, I realize I can do it. Don’t be surprised if things are quiet on the blog over the next month. I may just be a little busy! Anywho, how about a little Five for Friday for you. 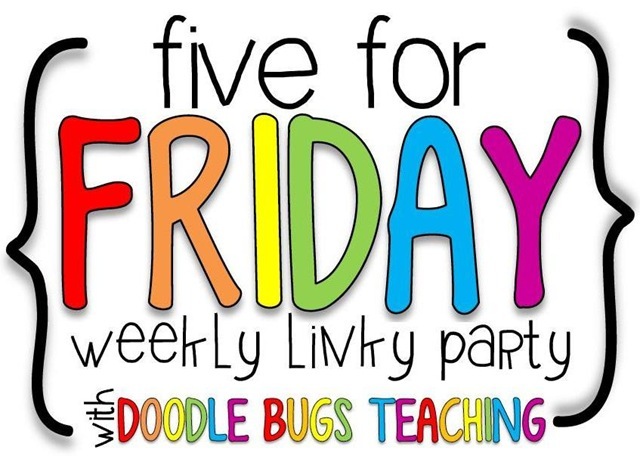 I am linking up with Doodle Bugs Teaching to share my 5 highlights for the week. 1. Somehow I had missed last week. We celebrated our 100th day of school and it was fun as always. We do 100 minutes of fun in grades k-3, so we are outside most of the morning. The kids go to various stations that parents and middles school kids run. I also celebrate summer birthdays on the 100th day, so we had a whole day of fun! 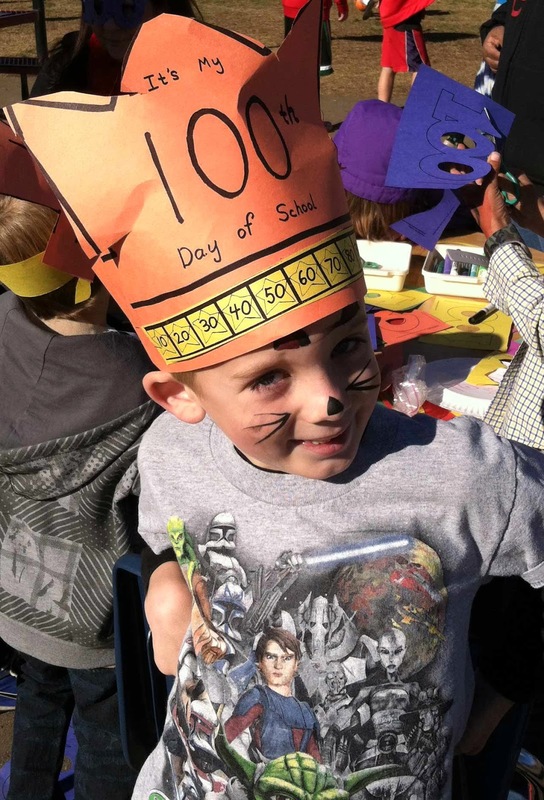 Here’s my little guy experiencing his first 100th day as a kindergartner. 2. The rain finally arrived to California this week. I know we really need it, but I was kind of enjoying the 70 degree weather. I won’t complain, I know many of you are getting smothered with snow and frigid temperatures. Hang in there! 3. We worked on our life-sized penguins this week. The kids love this project. It’s fun for them to see how tall penguins can be. We made adelie penguins this year. First we measured using pre-cut adding tape. Next we drew and paint. Last, the parents cut out the penguins. You can see last year’s penguins here. 4. Friday in first grade was our Antarctic Adventure Day. We set up 4 stations for the kids to rotate through; making ice cream in a bag, measuring penguins, blubber fun and penguin identification. They kids had a blast! The penguin identification was great. The kids had to use an id chart that they made to identify real penguins that we had printed out and laminated. 5. Friday I received an email, along with my grade level partners that we get to attend the Monterey Bay Aquarium Teacher Open House. I’m so excited! We get to have a sleep over with other teachers who have been selected. It’s five hours from here, so it will be a long trip for one night but so worth it! Hi! I love your Artic Station idea. Is there any way you can elaborate more on what they each include? Thanks!